Fed up with plugging punctures and dealing with wheels and tyres shattered by potholes the AA las launched a Multi-fit spare wheel that can fit almost any car. This allows a motorist with no spare wheel to get a punctured tyre to a tyre depot without further damage, and where rims and tyres have been damaged beyond repair it can get them to where replacements can be purchased. Most current cars are supplied with nothing more than what is laughingly described as a "tyre repair kit". This comprises a latex solution to be introduced via the valve (after removing the core) and a compressor. Unfortunately, in 95% of cases, the hole is too big and the solution simply squirts out after ruining the carcass of the tyre, meaning it has to be replaced, quite often at a distress cost of £250 plus. As well as that, the ridiculous obsession for big wheels and low profile tyres, coupled with Britain's ruined roads, creates a likelihood of potholde damage to both tyres and rims, making on-the-spot repairs impossible. The AA is called out to half a million motorists stranded with tyre damage every year. It is now the main reason for callouts for both the AA and the RAC. The AA's Multi-fit spare wheel doesn't prevent these problems. But at least it enables motorists to limp away to someone who can fix or replace their tyre or wheel with the minimum inconvenience. 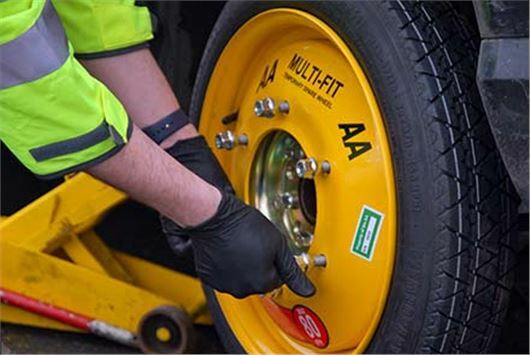 The AA’s Patrol of the Year, Max Holdstock, says that often, more than an hour can be saved through use of the Multi-fit wheel. "A range of four- and five-stud hubs and spacers mean the Multi-fit wheel can fit most cars. It’s also useful in situations where I need quickly to get a family and their car to a place of safety even if there is a spare, but it’s beneath a boot full of luggage or in a seized-up under-chassis carrier. In the past, a flat meant the patrol removing the offending wheel and leaving the car on a jack, taking the member to a depot with the wheel to have the tyre replaced or repaired, then returning to the vehicle. And possibly recovering the vehicle to a safe place before all that happened. That’s a big time-saver." Only some cars with permanently all-wheel drive that cannot tolerate disparities of wheel sizes and some high performance sports cars are not suitable for fitting a Multi-fit wheel.